" Articles in Category: Paul Ryan	"
"Someone has to explain, if our economy is doing so great, how come everyone is broke?," Bill Maher asked during a recent segment of HBO's Real Time in the middle of Trump's 35-day federal government shutdown over December and January. "To me, the real lesson of this government shutdown," he argued, "is that we found out that federal workers, quintessential middle-class jobs, can't afford to miss one paycheck!" He's right. Remarkable stories made their way into the media during the shutdown, about struggling furloughed federal workers, some of whom had been working for the same agencies for decades, forgoing medical care, at risk of losing their homes or being forced to use free food pantries after missing one single pay day. The U.S. has been slashing taxes, largely for the wealthy and corporations, for decades now as middle-class wages have remained stagnant and poverty continues to grow in the richest nation on earth. That, even as the rich get obscenely richer and Americans are told we simply can't afford our existing social safety nets and government programs, much less expansions of them to include Medicare for All, a Green New Deal or free college tuition --- even though they are all wildly popular ideas. As Ernie Canning recently summarized: "81% of the electorate support a Green New Deal. 70% of all Americans --- including 52% of Republicans and 84% of Democrats --- support Medicare for All. Some 75% of Americans support tuition free college. 82% of Americans want the federal government to negotiate lower prescription drug prices. 59% support the Ocasio-Cortez proposal to raise the top marginal tax rate to 70%." So, did the month long federal government shutdown teach us anything about how close most Americans are to the brink? Did our elected officials (ahem, Republicans) actually notice or care? 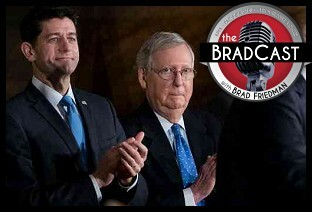 This past week, U.S. Senate Majority Leader Mitch McConnell (KY) and GOP Senators Chuck Grassley (IA) and John Thune (SD) introduced the "Death Tax Repeal Act of 2019" to do away all together with estate taxes for the very wealthy, even though, as our guest today points out in a recent Common Dreams column, the current estate tax applies to fewer than two dozen people in those three Senators' states combined. Racial inequality means that economic inequality is even worse for those who aren't white, begging the question as to why it is described as "economic anxiety" when white people are feeling squeezed, but dismissed as poverty and laziness from everyone else. We're joined to discuss all of this today by author CHUCK COLLINS, an expert on U.S. inequality and the racial wealth divide at the Institute for Policy Studies. He is also co-editor of Inequality.org and a contributing columnist at many outlets. 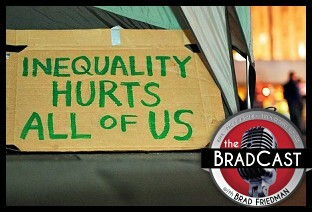 Collins discusses how the inequality gaps have become so wide in the U.S.; why so many continue to support candidates for elected office who work against the economic interests of the poor and working class; how attitudes about race exacerbate the problem; and how we may finally be "heading into a re-alignment" with a new crop of progressive elected officials and a potential awakening of the American people after being conned for last 40 years. "I think a lot of people were surprised about the percentage of people who live in poverty, and who live paycheck to paycheck," he tells me about lessons learned during the shutdown. "I think it was eye-opening and even empathy-producing. I think people silently suffer the economic insecurities that they experience and this was another shared moment where a lot of people were saying, 'Yeah, I don't have any savings, I have no cushion, I have to go to the food bank and I'm a median income worker.' So I think it opened a lot of eyes, and potentially some hearts and minds, as well." "Forty years of stagnant wages has certainly hit a lot of white households," Collins explains. "There is a lot of rising insecurity, certainly coming out of the economic meltdown a decade ago. A lot of white families experienced a sort of shock and vulnerability and, I would say, kind of keeps us from being able to see the parallel experience of everyone else, and the fact that the racial inequalities are even deeper, and even more insecure. 37% of African-American households --- zero or negative wealth. 33% of Latino households --- underwater. So, yes, a lot of white people are feeling the pain, but a lot of people of all colors and all races are feeling that insecurity and pain." "Why wouldn't we want to have a minimal safety net?," he asks rhetorically, in response to my questions about whether so many popular policy ideas to help close the inequality gaps and lift the poor and middle-class may finally being getting a foothold. "Why wouldn't we want to have a system of higher education that allows young people to go to college and graduate without tens of thousands of dollars in debt? It worked for the post-World War II generation. It worked for millions of people who got debt-free college and launched their lives and careers. Have we forgotten that entirely? There's a certain amnesia at work, as well --- that public investments and public support have made it possible for lots of people to move forward in their lives and have good lives. And we shouldn't forget that when it comes to the next generation." "I think we're heading into a kind of realignment," Collins adds optimistically, underscoring some of his recent articles on the trillions in revenue that could be raised through Elizabeth Warren's proposal to tax the ultra-wealthy and Bernie Sanders' plan to increase not decrease the estate taxes on inheritances over $1 billion. "I think most people understand that these inequalities and insecurities are a dead end. They also are getting tired of hearing billionaires telling us what to do and how the economy should be organized, realizing that this corrosive corruption and concentration of wealth at the top is bad." There is lots to dig into in today's full conversation with Collins. Donald Trump's grip on reality seems to be slipping more and more each day. Or, at least his interest in reality is slipping, if not his interest in deceiving his supporters and everyone around him about demonstrable reality. That sentiment was, perhaps, best summed up when, on Tuesday, the five-time draft dodger declared at the Veterans of Foreign Wars (VFW) annual convention in Kansas City: "What you're seeing and what you're reading is not what's happening." Got it? The Administration now (quietly) concedes they were wrong about last year's massive tax cuts for corporations and the wealthy paying for themselves through a rise in federal revenue. In the first half of 2018, we now know, corporate tax revenue plunged to its lowest level since such data was first tracked beginning in the 1940s. Thanks to slashed corporate tax rates, federal revenues are now lower than the then-historic plunge following the 2017 economic collapse. And, with that, deficits are now set to rise above $1 trillion annually for the foreseeable future. That, of course, is the exact opposite of what Trump, his White House and Congressional Republicans told Americans last year when pushing for their new tax rates and even worse than real economists at the time had predicted. Then, after former CIA Director John Brennan declared Trump's "performance" at his joint press conference with Vladimir Putin in Helsinki last week was "nothing short of treasonous," the White House announced they were seeking to remove his security clearance, along with five other former top U.S. intelligence officials (two of whom no longer have such a clearance anyway) who have been critical of the President's behavior and statements regarding the investigation into Russia's alleged cyberattacks and other interference in the 2016 Presidential election. The rank politicization of security clearances by a White House may be unprecedented and even one of many impeachable offenses by this President, but does his behavior regarding Russia really rise to "treason", as Brennan argued? 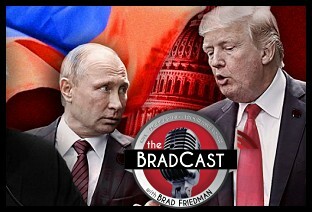 BRAD BLOG legal analyst ERNEST A. CANNING joins us today to discuss his recent article on the Constitutional definition of "treason" (the only crime defined in the founding document and one that is punishable by death) and whether the charge could possibly apply to Trump, given that we are not --- at least officially --- "at war" with Russia. Canning, while he's here, also details two very encouraging court rulings handed down in advance of the crucial 2018 midterm elections, one from a federal court in Florida yesterday, and the other from a state court in Iowa today --- both regarding GOP attempts to restrict early voting and other related issues. In Florida, as Canning explains, the judge described the state's GOP-run state Election Division's restrictions on creating early voting sites at state colleges and universities displayed "a stark pattern of discrimination" in violation of the U.S. Constitution's 26th Amendment. And, in Iowa, the court ruled the Republican state legislature's newly enacted law and GOP Sec. of State effort to promote it "substantially and directly interfere with Iowans' constitutional rights to vote." 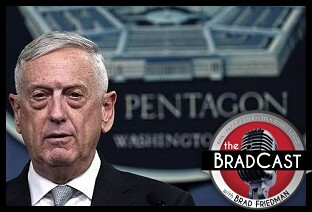 On today's BradCast, Trita Parsi helps us make sense of the Israel/Syria attacks. I'm Angie Coiro of In Deep sitting in the host chair today. Trita Parsi from the National Iranian American Council helps us get through the "they started it" claims around yesterday's attacks. We spend some time deconstructing media reports and voices on the issue. He talks, too, about the Americans still held hostage in Iran, and potential long-term consequences of Trump pulling out of the nuclear agreement. Then Brad Adams of Human Rights Watch talks about the release of American hostages from North Korea. I ask him about Israel kicking a Human Rights Watch employee out, based on his support of the Palestinian-led Boycott, Divestment, Sanctions (BDS) movement. Then it's back to Gina Haspel, as more news came out today about inaccuracies in her Senate testimony. Daphne Eviatar of Amnesty International details Amnesty's call for Haspel's CIA bid to be rejected. Finally, we dig to the source of all those troublesome Scott Pruitt emails with Elena Saxonhouse, senior attorney with the Sierra Club. It was the Sierra Club's dogged insistence on getting 24,000 pages of emails that opened up all those tales. On Sunday night, fired FBI Director James Comey described Trump as "morally unfit" for the Presidency in a prime-time ABC News interview, and on Monday, just before air today, Sean Hannity of Fox "News" was revealed in federal court to be a secret client of Trump's hush money payoff "fixer" Michael Cohen, and Cohen and Trump's motion to review documents seized in the raid on Cohen's office and residences last week was denied (for now) by the federal judge. Moreover, there is absolutely no legal authority whatsoever for Trump's attack --- either domestically or internationally --- despite various claims to the contrary. Shamefully, most of Congress, both Republicans and Democrats alike, have so far failed to demand accountability for the unconstitutional use of military force (even after threatening President Obama with impeachment when he wanted to launch a similar attack in response to an alleged Syrian chemical attack in 2013). For his part, the hapless Trump, who mercilessly derided Obama for calling for Syrian airstrikes in 2013, took to Twitter on Saturday to echo George W. Bush's infamous appearance on a U.S. Aircraft Carrier in 2003 after the ill-fated invasion of Iraq, to declare "Mission Accomplished" in Syria. Friday's unlawful US attack, as we also discuss today, is believed to have cost some $200 million. That could have paid for the replacement of all of Flint, MI's lead water pipes some four times over, as new studies reveal that reading proficiency levels for third-graders in Flint has plummeted in the wake of the lead drinking water contamination crisis. That continuing crisis came about after MI's Gov. Rick Snyder (R), following his election in 2010, ordered an Emergency Manager takeover of the city and a subsequent change to its water supply. First up today, Donald Trump prepares to go to war in Syria and, despite mercilessly criticizing previous Presidents for revealing their intentions before taking military action, does exactly the same today on Twitter, in order to give a warning to Syria's top ally, Russia. That, despite unanswered questions about who was actually behind a recent reported chemical attack in a rebel-held town in the war-torn nation, the U.S. Congress' failure to authorize any such military action, as per the Constitution, and the threat that both Russia and Iran say they will target a response to efforts by the U.S. and its allies in the region like Israel. Next, U.S. House Speaker Paul Ryan decides to call it quits, rather than risk losing his re-election bid this November in a predicted "blue wave", just after a new report from the non-partisan Congressional Budget Office (CBO) projects trillion dollar budget deficits as far as the eye can see, thanks to the GOP/Trump tax cuts and their recent spending bill. So much for the long-time, so-called "budget hawk" that Ryan (and Trump) pretended to be, while spending years attempting to gut Medicare, Medicaid and Social Security for Americans. Then, we're joined by CARROLL MUFFETT, President and CEO of the Center for International Environmental Law to discuss a remarkable trove of recently unearthed internal documents from Royal Dutch Shell, revealing that the oil giant, just like Exxon and Mobil Oil before them, have known for decades about the threat of global warming caused by the burning of fossil fuels. Muffett describes the newly unearthed documents, as detailed in their jaw-dropping new report, "A Crack in the Shell" [PDF], which shows that, as long ago as 1958(! ), Shell was well aware of the dangerous consequences of carbon dioxide in the atmosphere caused by the burning of oil. And, as early as 1962, as the documents reveal, even urged internally "a "serious consideration of the maximum utilization of solar energy". "The earliest document that we have with respect to Shell," he tells me, "was a report for the oil industry's Smoke and Fumes Committee that was reporting on research that the industry was funding into a variety of air pollutants. And even in 1958, one of those air pollutants was the pollution of the atmosphere by carbon from fossil sources." "By 1962, we can demonstrate that Shell's chief geologist was very explicitly acknowledging the links between Shell's products and carbon dioxide from fossil fuels, and the potential for global warming," says Muffett. "So much so, that this scientist even highlighted the recommendations of other scientists that the switch to solar energy should begin as soon as possible." Despite their scientific knowledge, as Muffett details today, the company eventually joined others in downplaying the threat of man-made climate change and now, according to the longtime attorney and leader in the newly emerging field of legal responses to global climate change, may face increased exposure for their part in our ever-worsening climate crisis. "We see a remarkable transformation that goes on between 1988 and 1991, where the company is acknowledging these risks, and then by the mid-90s, Shell is, as with other oil companies, actively promoting uncertainty, and the need for inaction instead of action, in the face of mounting evidence," he explains, adding: "What we can now show, and this is very legally relevant, is that for decades, Shell was aware of those risks, and it continued to take those risks on the assumption that, ultimately, it would be consumers and governments that bore the cost, rather than Shell itself." Finally today, a renewed bi-partisan effort emerges in the U.S. Senate to protect Special Counsel Robert Mueller from being fired by the President. But, with GOP leaders like Mitch McConnell in the Senate and Ryan still in the House, the legislation may not get very far, even as Trump continues to fume --- and lie --- about the ongoing probe. It was the first such victory for a progressive vying for an open seat on the state's high court in almost 25 years. 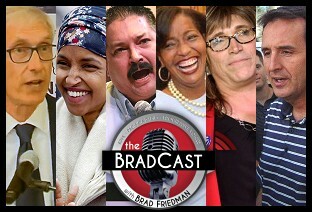 Or, as our guest today, author/journalist and Wisconsin's own JOHN NICHOLS describes it: "The first statewide race that really pitted left against right in this kind of way, in the country, in 2018. And the progressives won. And they didn't win by a little." In fact, the reported results find that progressive Milwaukee County Circuit Court Judge Rebecca Dallet crushed Sauk County Judge and GOP attorney Michael Screnock, "literally a point-man for much of [Gov. 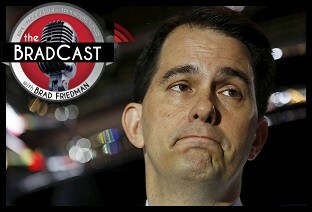 Scott] Walker's agenda", says Nichols, by 12 points. Walker also saw his ballot proposition that would have done away with the statewide office of Treasurer --- allowing the executive office more control over billions in public education funds and tens of thousands of square miles of public lands --- defeated by an even larger margin. For his part, Walker, who faces re-election this November, took to Twitter to warn again of a "#BlueWave" coming this November, a continuation of the "WAKE UP CALL" panic he first unleashed after a long-held Republican seat in the State Senate was lost to a Democrat in a special election in January. Nichols observes: "One of the most disciplined political figures in the United States, a guy who really, by any measure, keeps his calm through some of the toughest political fights you've seen, appears to be losing it. He appears to be freaked out by election results he can't control." "I must say it's especially nice to be talking about something good happening in Wisconsin, rather than our many complex and sad stories," adds Nichols, describing last night's outcome as "the first genuinely good election night for Wisconsin progressives" in many years. Nichols and I also discuss --- and, yes, debate --- the danger to democracy posed by partisan judicial elections like those in the Badger State and elsewhere across the country. And The Nation's Washington Correspondent and longtime Associate Editor of Madison, Wisconsin's Capital Times also rings in with his thoughts on whether U.S. House Speaker Paul Ryan (R-WI) could actually be unseated this November and/or whether he might drop out of the race all together. 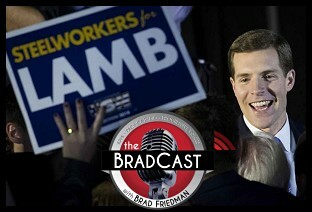 Lamb has declared victory, (as has the NY Times, while AP still has it as "too close to call") in the district that went to Donald Trump by nearly 20 points in 2016. But Republicans are still holding out hope for a miracle, a "recount" and/or a lawsuit for their candidate who received a full court press from Donald Trump over the past week. That press included a weekend rally with Saccone and new steel tariffs announced by the President just last week, with an eye towards this bellwether race in "Steel Country", just outside of Pittsburgh. We have full details on where the razor-thin results currently stand (just over 600 votes separate the two candidates, as of air time, in a race with more than 228,000 votes cast) and how such a "recount" would work in the state which still, shamefully, forces the vast majority of its voters to vote on 100% unverifiable touch-screen voting systems. No matter the final results, Democrats are ebullient about what this huge "red to blue" swing may bode for their chances of taking back the House in November's crucial 2018 mid-term elections, even as GOPers from PA to Capitol Hill to the White House are offering some pretty remarkable spin in response. 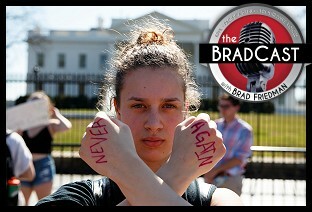 Meanwhile on Wednesday, tens of thousands of students took to the streets from coast-to-coast with a massive school walkout to rally for gun safety legislation one month after the massacre which took the lives of 17 at Marjory Stoneman Douglas High School in Parkland, Florida. The students stood up, even as a cowardly President Trump continues to retreat from earlier promises on reforms, while trying to spin his own personal fears of the powerful gun lobbyists at the NRA. 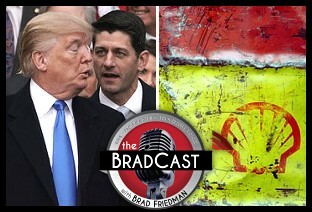 But first up, on another insanely busy program, we detail what happened on Thursday night and Friday morning when Sen. Rand Paul (R-KY) single-handedly held up passage of the new, bi-partisan government spending bill, which includes up to $500 billion in new military and domestic spending, as well as disaster aid. In shutting down the government for the second time this year, for about seven hours, Paul described approval of the bill and increased deficit spending by his fellow Republicans to be the "the very definition of intellectual dishonesty [and] hypocrisy". That, after the intellectually dishonest and hypocritical Paul just voted in December, along with the entire Senate Republican caucus, for massive, unpaid-for tax cuts set to blow a $1.5 trillion hole in the national debt. Then, late details on this week's newest scandal surrounding the resignation of White House Staff Secretary Rob Porter on Wednesday, following the public disclosure of his alleged violence against his two former wives. 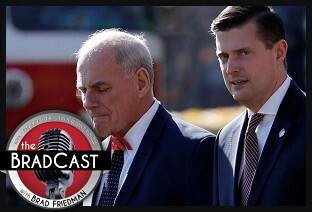 Among the new developments: Donald Trump's Chief of Staff John Kelly and other top White House officials reportedly knew about the charges long ago; Kelly has now said he'd be willing to resign over what happened, and several outlets are reporting that their remain "dozens" of White House staffers, some in very senior positions, still operating without full security clearance. That suggests that many of them, like the President's son-in-law Jared Kushner, may never receive full security clearances, despite Trump and the GOP having run their entire Presidential campaign hypocritically (and falsely) charging that Hillary Clinton carelessly allowed classified information to be seen by those without proper security clearance. According to Rep. Sean Patrick Maloney (D-NY), a former White House Staff Secretary himself, describes this situation as "nuts", saying that Porter would have handled the nation's most highly classified secrets in his top Oval Office role. He believes an investigation is warranted to determine what both Kelly and Trump knew about the "eminently blackmailable" Porter and who gave him the okay to remain on, even after the FBI had determined he would not qualify for a full security clearance. Next, we're joined by Congresswoman Lee, to detail her new "Woman and Climate Change Act of 2018" [PDF]. We discuss how women and girls around the world are "bearing the brunt in many ways", as the first and most affected victims of the dangerous effects of global warming and whether Republican members of the bi-partisan Women's Working Group may help in co-sponsoring this effort, despite "the climate deniers who are within the federal government running the show." "Women are especially vulnerable to these changes in the environment," Lee explains. "We know women are the ones that are finding water, collecting food, caring for family members. And so now, more than ever, we need to focus on climate change as a whole, but also ways to empower women, as they are the most vulnerable people, and will be impacted most by these health epidemics, refuge crises, forced migration --- all the issues that we know women are disproportionately impacted by." She also shares her opinion on the odds of Ivanka Trump, self-proclaimed women's champion, coming aboard this particular campaign. Lee, a former co-chair of the Progressive Caucus in the House, who now serves as Senior Democratic Whip, responds as to whether Democrats fought hard enough, during the recent government funding battle, to protect "Dreamers" facing imminent deportation as early as March 5, unless a legislative deal can be struck, and whether she believes House Speaker Paul Ryan will ever allow such a measure to be brought up for a vote. She urges Americans to keep contacting their members of Congress on both of these efforts. "Listen, you have to stay optimistic. Otherwise we get stuck with their negativity and trying to take us back. The public has to be hopeful and has to work hard to get this done," she tells me. Finally, Lee also shares her thoughts on the bi-partisan momentum in both the House and Senate for finally repealing (and replacing?) the 2001 AUMF. "Congress has been missing in action. We need to do our job, and we're not. But, believe you me, we are building support to do this," she insists. "Hold your elected officials accountable!" On Thursday, as Congressional Republicans attempted to pass a short-term spending bill to keep the government open --- after a long-term deal was plunged into chaos when Trump refused a deal that included immigrants from "shithole countries" --- Trump did it again. He tweeted against a GOP stopgap plan which includes reauthorization of the Children's Health Insurance Program (CHIP). The reauthorization, which both helps sick kids and saves the government billions of dollars, was included by Republicans in hopes of enticing Democrats to help them avoid a full government shutdown as of midnight Friday. Most Dems don't seem to be buying it --- despite Ryan, once again, calling the White House to get Trump back on board --- as they appear unwilling to help Republicans out of this jam without the inclusion of a fix to the Deferred Action on Childhood Arrivals (DACA) program. 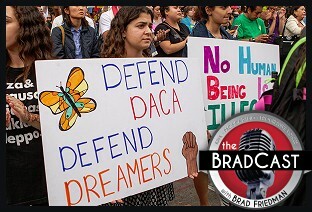 Republicans refuse to include a fix to DACA, the Obama-era protection against deportation of some 800,000 children of immigrants, which Trump reversed, in their short-term measure. Dems say they won't support such a bill unless DACA is included. In other words, the children helped by both CHIP and DACA are now being held as hostages by the Republican Party. The measure squeaked by tonight in the U.S. House, but passage in the Senate, where 60 votes are needed to overcome a filibuster, is far from certain. Then, after Donald Trump's fake "Fake News" awards face plant on Wednesday night, we have a few real "Fake News" awards to offer, based on actual facts, as we reach the end of Trump's agonizingly long first year in office this weekend. 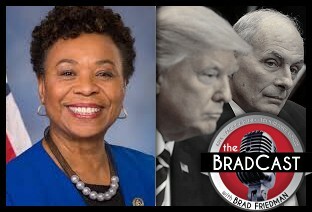 First up, today in the U.S. House, Republicans, with the help of a number of Democrats, voted to approve the re-authorization of a sweeping surveillance law --- Section 702 of the FISA Amendments Act --- that results in the phone calls and emails of millions of Americans being scooped up for review without cause or court warrant. Civil libertarians on both the Right and Left have been hoping, for years, to end or radically limit the dragnet measure which they say violates Constitutional rights to privacy and against unwarranted search and seizure. Though the White House has been lobbying for this re-authorization, which must still be approved in the U.S. Senate, a tweet this morning by Donald Trump, while watching Fox "News", harshly criticized the measure. Following that tweet, two hours later, after a call from House Speaker Paul Ryan (R-WI) and chaos in the House GOP caucus in response to the tweet, the President took to Twitter again, this time in support of the measure, which he clearly knows nothing about. Only his later description of Haiti and African nations as "shithole countries", as reportedly uttered during bi-partisan immigration negotiations today with lawmakers, moved the nation's media on to the next Trump embarrassment of the day. In the meantime, as Trump and Congressional Republicans pretend to be concerned about terrorism and putting "America first", a major terrorism case brought by the Dept. of Justice just before Christmas has gone almost entirely unnoticed by the media, after the DoJ itself failed to even issue a statement on the recent arrest. Why? The obvious reason is that it involves a white supremacist neo-Nazi from Missouri (as opposed to someone with a middle-eastern sounding name) who had amassed an arsenal of deadly weapons in hopes of allegedly "killing black people". But there are several other reasons why the case has largely failed to become much more than a blip on the corporate media and cable news radar, much less be mentioned by either the DoJ or tweeted about by Donald Trump. We're joined by HuffPost's senior justice reporter RYAN REILLY to discuss the matter today. 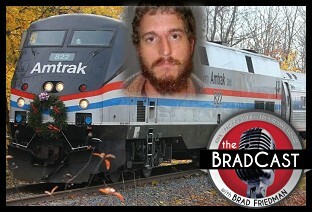 Reilly has been investigating the disturbing lack of coverage of a case which includes an Amtrak train stopped by the accused 26-year old right-winger, Taylor Michael Wilson, in the dead of night in the middle of rural Nebraska several months ago, before he was arrested, then released on bail for several weeks, before finally being charged on a number of federal terrorism counts before Christmas. "When I didn't see the story pop up until Friday, I was like wait, how did I miss this? What's going on? Federal prosecutors are charging a white supremacist with terrorism?," Reilly says, explaining why the case in which Wilson was originally charged with "criminal mischief" went unnoticed by media and unreported by law enforcement officials, who are usually eager to get publicity for terrorism cases. "The broader issue is that it's a demonstration, an illustration of exactly how differently the Justice Department apparatus, and the national security apparatus of the US Government, treats domestic terrorism in comparison to anything that remotely has a sniff of anything related to Islamic terrorism," Reilly tells me. The reasons, for that, above and beyond strictly racism (which is certainly a large part of this), may be more complicated than you think, both statutorily and Constitutionally. None of those reasons, as we also discuss, necessarily excuse the media's apparent lack of interest in such cases, despite the fact that domestic terror remains a far greater threat to Americans than the threat posed by those claiming an association with international terror groups. We continue today to try to focus on a number of important issues that aren't receiving the coverage they deserve, but that voters need to know about as we head toward the crucial 2018 mid-term elections. Among those issues is the strange matter of the wildly unpopular GOP tax bill which, oddly enough, most Republicans members of Congress don't seem overly concerned about. Why would that be? One reason, as cited by GOP leadership in Congress, is that they believe Americans will come to love the new scheme once they begin to see more money in their paychecks this year. But how much more money will average middle-class Americans actually see, if any? That may be up to one man who now heads the IRS, with an "Acting" title, even as he works for the Trump Administration's Treasury Department at the same time in what seems a blatant conflict of interest. Remember the phony "IRS Scandal" that Republicans and Fox "News" and Donald Trump all still pretend was an actual scandal involving Barrack Obama using the IRS for political purposes (which the IRS Inspector General has since completely debunked with far less fanfare)? Well, now the President of the United States actually does have a ringer at the IRS, his unconfirmed Acting IRS Chief David Kautter [pictured above]. Could he be the "Ace in the Hole" for Republicans on their tax bill? 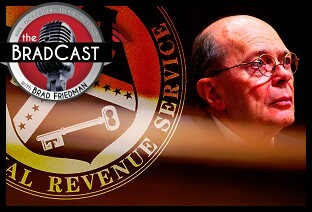 Investigative financial journalist DAVID DAYEN, who recently wrote about this for The Nation, joins us today to explain how Trump's ringer at the Internal Revenue Service may be able to game the nation's paycheck tax withholding scheme, beginning in February, in order to try and turn the tide in favor of the GOP tax scam in advance of the 2018 mid-terms. "Instead of putting someone up for a vote in the Senate and going through the confirmation process, they just made this guy, Kautter, the IRS Commissioner, and there is nobody on the horizon who is set to replace him," Dayen explains. "So, this guy is doing two separate jobs, essentially. He is the Assistant Secretary for Tax Policy --- which is a position where he was working with members of Congress to put the tax bill forward --- and he's supposed to be the non-partisan official who is implementing that same policy." Since most of the changes to the tax law won't be seen by average Americans until 2019, when they file their 2018 taxes, paycheck withholding is "the only way that people are really going to experience this tax bill between now and the midterm elections," says Dayen. "And they'll see that difference in their paychecks, allegedly, by the beginning of February." But the way the federal government determines the formulas for withholding is "more art than science," Dayen tells me. The question is now whether Kautter, who previously worked at financial giant Ernst & Young assisting huge corporations avoid taxes, will "move resources toward making sure that the assumptions that are made in withholding work to the benefit of ordinary people, so that they get more money now that they might have to give back in April of 2019? But [that] will create the feeling that there is this boost from the tax cut that is illusory, and that might help Republicans in the midterms?" Republicans, he argues, seem to be "really relying on this. They're saying, 'Just you wait and see, America. Wait until February and all of your questions about the tax bill will be answered by your huge gain in your paycheck.' There's tons of pressure, from both the White House and from Congress, to get this done."